A 49-year-old man was admitted to our hospital with a 1-month history of dysphagia. An upper endoscopy revealed a lower esophageal submucosal tumor. Immunohistochemical staining of the biopsy specimen revealed KIT positivity. Thus, the tumor was diagnosed as a gastrointestinal stromal tumor (GIST). After 6 months of imatinib treatment, the tumor decreased from 92 mm × 55 mm × 80 mm to 65 mm × 35 mm × 55 mm in diameter, and surgery was performed. The tumor was completely resected without rupture, by partial esophagogastric resection through a thoracotomy incision, using an abdominal laparoscopic approach. Immunohistochemical staining revealed that the tumor was negative for c-kit but positive for CD34. Genetic examination showed that the tumor had a mutation in exon 11. The patient experienced minor leakage but recovered conservatively. Adjuvant imatinib was initiated 64 days after surgery. 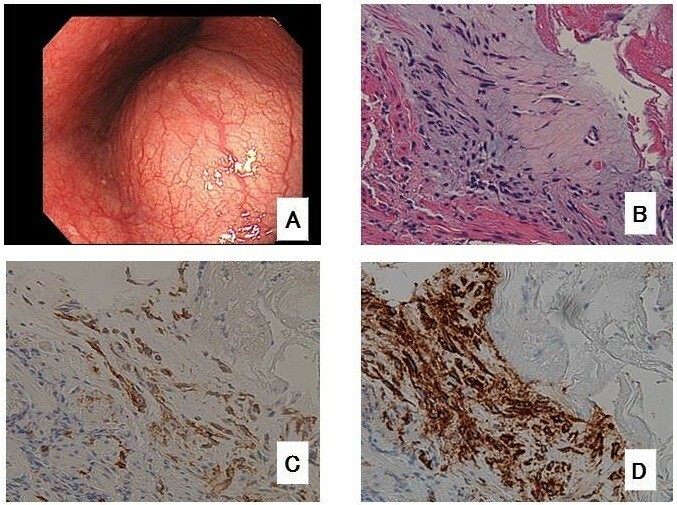 We report this rare case to show the potential of preoperative imatinib treatment in patients with large esophageal GISTs, to achieve complete resection without rupture. Gastrointestinal stromal tumors (GISTs) are mesenchymal tumors of the gastrointestinal tract, commonly found in the stomach (60% to 70%) and small intestine (20% to 30%) [1, 2]. Surgery is the first treatment for resectable GISTs, which cures approximately 60% of patients . However, the prognosis of patients who relapse is poor. Imatinib mesylate is now the standard drug for patients with unresectable or metastatic GISTs and was recently approved for use as an adjuvant treatment [4, 5]. Currently, there is no evidence of an effective neoadjuvant therapy for GISTs, especially for very large primary GISTs, which have an increased risk of a positive resection margin . As esophageal GISTs are very rare, accounting for <2% of all GISTs [2, 7], the available literature is limited. Moreover, the use of imatinib therapy followed by surgery has been published only for a few cases . We report a large esophageal GIST in a 49-year-old man who underwent surgery after neoadjuvant chemotherapy. A 49-year-old man was admitted to our hospital with a 1-month history of dysphagia. He did not have any history of illness or any significant family history. Physical examination revealed no abnormalities. Standard laboratory test results on serum and urine showed no significant findings. Tumor markers such as carcinoembryonic antigen, carbohydrate antigenic determinant 19-9 and squamous cell carcinoma antigen were also within the reference limits. An upper endoscopy revealed a submucosal tumor with a narrowed lumen in the lower esophagus (Figure 1A). 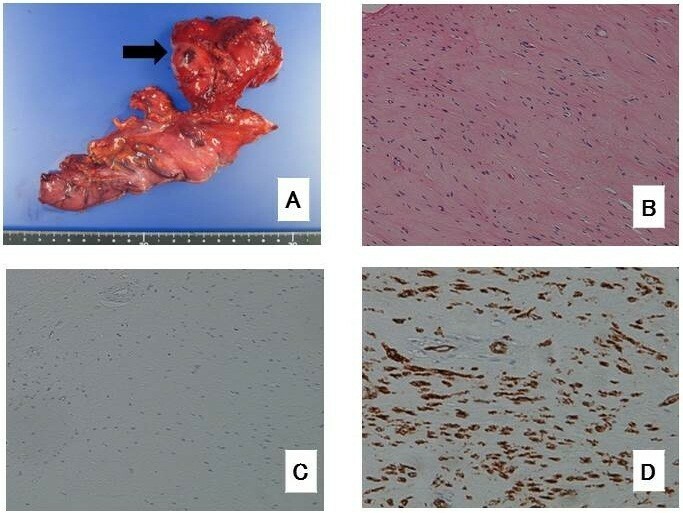 After a fine-needle aspiration biopsy, the tumor was diagnosed as a GIST, characterized pathologically by H & E staining and immunostaining (Figure 1B,C,D). A computed tomography (CT) scan showed a mass, 92 mm × 55 mm × 80 mm in diameter (Figure 2A), at the lower esophagus and the maximum standardized uptake value (SUV max) was 4.9 on a positron emission tomography (PET)-CT scan (Figure 2B). There was no apparent distant metastasis. The tumor was classified as intermediate risk according to Fletcher’s classification . It was judged to be resectable, but with a risk for rupture during resection because of the size and localization of the lesion. Therefore the patient received neoadjuvant imatinib (400 mg/day) treatment and was followed-up for 2 months with CT scans to assess the therapeutic effect. He was treated for 6 months with chemotherapy and the tumor shrank by 25% (Figure 2C). 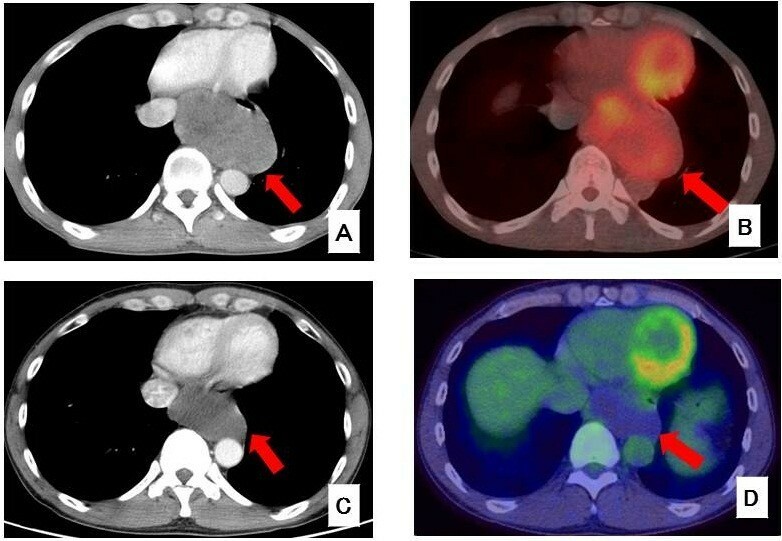 A PET-CT scan showed a reduction in SUV max to 1.2 (Figure 2D). Preoperative image and tumor biopsy images. (A) Endoscopic image taken before chemotherapy showing the tumor with a smooth surface in the lower esophagus. Histopathologically, H & E staining showed that the spindle tumor cells had no mitotic activity, as shown at × 200 (B). The tumor cells were positive for c-kit, as shown at × 200, (C) and CD34, as shown at × 200, (D) using immunohistochemistry. CT and PET-CT images. (A) CT scan before chemotherapy. The tumor was 92 × 55 mm × 80 mm in diameter. (B) PET-CT scan before chemotherapy. SUV max was 4.9. (C) CT scan after chemotherapy. The tumor was 70 mm × 37 mm × 60 mm in diameter. (D) PET-CT scan after chemotherapy. SUV max was 1.2. The patient underwent surgery after the chemotherapy. The surgical procedure was a partial esophagogastric resection through a thoracotomy incision, using an abdominal laparoscopic approach. A lymphadenectomy was not performed. On gross examination, the resected tumor was soft and had shrunk to 65 mm × 35 mm × 45 mm in diameter (Figure 3A). The esophageal mucosa appeared normal without ulcerations. Histological analysis showed that the tumor consisted of spindle cells with no mitotic activity (Figure 3B). Immunohistochemical staining revealed that the spindle cells were negative for c-kit (Figure 3C) but positive for CD34 (Figure 3D). Genetic examination showed that the tumor had an exon 11 mutation. Resected surgical specimen. (A) The resected tumor was approximately 65 mm × 35 × 55 mm in diameter. (B) Histopathologically, H & E staining showed that the tumor cells had no necrosis and mitotic activity, as shown at × 200. The tumor cells were negative for c-kit, as shown at × 200, (C) and positive for CD34, as shown at × 200, (D) using immunohistochemistry. The patient experienced aspiration pneumonia and minor leakage after the operation, but recovered conservatively from both conditions. He was discharged 52 days after the surgery, and adjuvant chemotherapy (imatinib, 400 mg/day) was initiated at 64 days after the surgery. There has been no recurrence for 12 months post-surgery. Complete surgical resection is the standard treatment for localized GISTs; however, 40% to 90% of curative resection patients experience recurrence . Esophageal GISTs are rare, highly vascularized tumors. Large tumors specifically have a tendency to rupture or have a risk of a positive margin despite a macroscopically complete resection. Tumor rupture or the presence of a residual tumor is strongly associated with recurrence and poor prognosis [11, 12]. The biological potential of stomach or small intestinal GISTs is related to their size and mitotic activity, which may also be true of esophageal GISTs. The prognosis is commonly stratified according to the Joensuu risk criteria  and accurate risk stratification is important in considering adjuvant imatinib therapy. It has been established that 3 years of adjuvant imatinib is beneficial for recurrence-free survival and overall survival for-high risk GISTs . Although the benefit of imatinib for malignant or high-risk GISTs is beyond doubt, the clinical outcome of neoadjuvant treatment has not yet been established. In our case, we were able to a perform complete resection of the GIST owing to the decreased tumor size after the treatment with imatinib. The tumor was diagnosed to be of intermediate risk according to Fletcher’s classification . We used neoadjuvant imatinib (400 mg/day for 6 months) to achieve complete resection without rupture. In our case, there was no rupture during the operation and a pathologically negative margin was obtained. The appropriate duration of neoadjuvant therapy with imatinib is controversial. Most of the positive responses to chemotherapy occur within 6 months of administration and secondary mutations may occur after 10 months of treatment, hence some reports suggest 6 months of neoadjuvant chemotherapy for GISTs [13, 14]. In our case, sufficient shrinkage of the tumor was attained after 6 months of treatment; therefore, a minimal resection could be performed during esophagectomy. The reason for the negative c-kit and positive CD34 findings, despite the tumor being positive for both markers preoperatively, is unclear. These biomarker changes may be because of the therapeutic effect of imatinib; however, whether these findings are indicative of a pathological complete response is uncertain. Tumors could show a completely altered morphology and immunophenotype after imatinib treatment; thus, pathologists should be aware of this phenomenon . There have been several case reports demonstrating that a complete response was obtained with imatinib treatment even in patients with metastatic GISTs . In summary, we reported a case of a large esophageal GIST that was successfully resected after imatinib treatment. Although the effects of neoadjuvant imatinib therapy on overall survival are not yet clear, long-term imatinib administration has the potential to promote curative surgery for some patients with large GISTs. We treated a case of a large esophageal GIST that was successfully resected after neoadjuvant imatinib treatment. When an esophageal GIST is a certain size, located in the narrow mediastinal space and is difficult to dissect, neoadjuvant imatinib treatment might be one of the options for a minimally invasive surgical resection without rupture. SY and KT wrote the manuscript. SY, KT, TS and NT performed surgery. KA carried out the pathological examination. HO was involved in the final editing. All authors approved the final manuscript.